Rik Web is a collection of sites, linked together only by the fact that they have been created by me, Rik Roots. Choose your poison carefully, and enjoy! Kalieda is a constructed world - a planet born in my imagination and realised on the internet. This is an ongoing and open ended project, so don't fret if you get lost in the mountains! Rik is proud to be publishing his work via Smashwords alongside many other independent authors - visit the Smashwords website to see the complete range of eBooks on offer there. The jungle city of Bassakesh holds the keys to the future of the Vreski Empire. It is the sole source of the valuable Vedegga dye; it is also home to the mysterious Servants, who harvest the dye. Delesse, the Bassakesh Governor's daughter, is marrying Loken, heir to one of the most powerful Clans in the Empire - whose leaders, Loken's own Father and uncle, are plotting to disrupt the dye harvest as part of their wider plans to win the aged Emperor's throne. When those hasty plans go awry a terrible plague is unleashed across Bassakesh, bringing widespread death and chaos. Aided by a collection of survivors and Servants, Delesse and Loken must travel through the jungles to face down and defeat the people who not only threaten the Empire's stability, but also ruined their wedding. 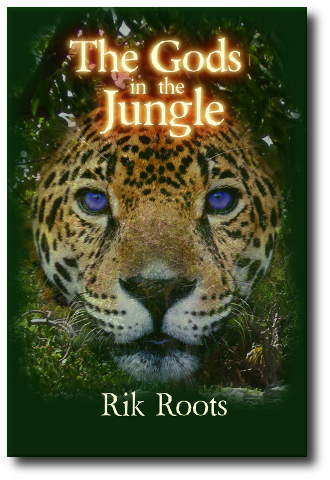 Set on a planet far from Earth, The Gods in the Jungle is an investigation of the drives and desires, fears and beliefs of the various peoples and classes of a crumbling society, through the eyes of those immediately involved in events which threaten to bring an Empire to its knees.